Star wide receiver Antonio Brown officially has a new team! 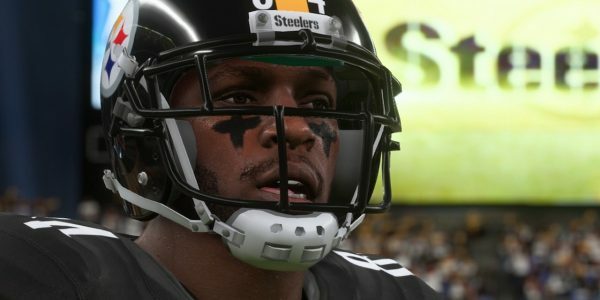 The longtime Pittsburgh Steelers star and Madden 19 cover athlete is now headed to play for the Oakland Raiders. That makes things extra interesting for Jon Gruden and the crew in Oakland. In addition, it gives gamers a new star to test out on the Raiders roster. Here are more details about the big Antonio Brown trade and how it will impact things. According to ESPN’s report, Brown is heading to Raiders in exchange for a third- and fourth-round pick. He’ll earn $54.125 million over three years with the new squad. However, the trade won’t be official until this coming Wednesday, per NFL rules. It’s also the second big trade that the Raiders have made, but their previous involved sending Khalil Mack to the Bears. To get fans hyped, the Madden 19 Twitter showed off a teaser video featuring their star cover athlete. Brown is shown off wearing a Pittsburgh Steelers but after a few spins, he changes into his new Oakland Raiders uniform. It appears so far he’ll wear the same number, but Oakland fans will be more interested in what numbers he puts up as a receiver for the Raiders. In the Madden game, he’ll bring impressive attributes to the Raiders’ roster. As gamers know, Antonio Brown entered the game as part of the Madden 99 Club and never dropped from that rating during the season. Brown has 99 for Catching and for Catches In Traffic. He also boasts 98 Agility, 93 Acceleration, 97 Elusiveness, and 92 Speed among other top attributes. His 2018 season with Pittsburgh included 104 receptions for 1,297 yards and 15 touchdowns. Oakland is hoping for similar numbers. Right now, they feature Derek Carr at the quarterback spot, so Brown could become one of his favorite options in the 2019 NFL season. The Raiders could look to acquire a different quarterback, though, as they have the NFL Draft to also look forward to. Brown also had a number of different cards released in Madden 19 for different Ultimate Team promotions. These have included a Power Up, Core Elite, Ultimate Kickoff, and the 95 OVR Ghosts of Madden card. It should be interesting to see if Madden 19 releases any new cards or promotions as the Brown trade is among several moves this offseason. Get more of the latest Madden news here.